Perfection for a manufacturing operation is the absence of inefficiency, or process waste. It is seamless execution. It is spending every minute of every day in a state of operational bliss where everything and everyone is in the zone of impenetrable harmony. Product quality is flawless; machines run like an impeccable script; manufacturing teams perform like a masterfully orchestrated symphony; and the supply chain delivers like clockwork. The first step in the Percent Perfect Methodology® (PPM) is to paint a clear picture of a manufacturer's operating parameters in a state of absolute zero losses such as profitability, operating costs, lead time, capacity, material costs, and others. The PPM is a methodology designed to determine and systematize the few critical operational disciplines needed make dramatic progress toward perfection. There is a powerful psychological and motivating effect to beginning the PPM methodology with defining perfection. This approach quickly shows the difference between 'how good you could be' and 'how good you currently are'. This creates an intense motivation to get better because defending the status quo becomes completely unacceptable by anyone's standards, especially for an organization with great opportunity for improvement. It also provides some insight to how much more efficient your competitors might be by presenting your performance on a spectrum of 0 - 100%. Additionally, the customer receives their 6 Rights - 100% of the time. This means the right product, at the right time, at the right place, in the right quantity, in the right quality, and at the right price. Continuous Improvement, in its purest essence, means closing the gap between your current state of execution and OP. It's a fantasy to think this can happen overnight. In fact, getting within 15% of perfection is considered World-Class execution, which can take years and most will never even come close. The point here is to define the true north for factory performance; and set the objective of your Continuous Improvement initiative, which is to eventually achieve OP, or to reach the North Star. Whether you are doing Lean, Six Sigma, Re-engineering, ISO 9000, Agile Operations, TPM, TQM, or any other Continuous Improvement program, it's important to know and understand your OP just like a navigator and the North Star. It's also important to know that perfection is theoretically unachievable. Hence, Continuous Improvement is just that...improvement that continues into perpetuity. In other words, everyday, your manufacturing operation should be inching (or sprinting - why not?) toward perfection, or OP. Step 1: Determine your maximum theoretical run rates. These are the greatest rates that your production equipment or teams can achieve before reaching the point of diminishing returns, which is when increasing speeds result in declining quality or system damage. Step 2: Determine the total runtime needed to execute your product mix at theoretical maximum run rates. All startup, changeover, shutdown, unplanned downtime, rate losses, and yield losses should be excluded. Theoretical Maximum Run Rates can be determined in a few different ways. Its imporatant to determine your theoretical max at the bottleneck process step. Wikipedia defines the bottleneck as "a phenomenon where the performance or capacity of an entire system is limited by a single or small number of components or resources." For all practical purposes, it's the step in the process that constrains the throughput of the manufacturing system. If the bottleneck is a mechanical process, you need to calculate the machine's cycle times from step 0 to step 0. It's important to capture the full cycle. Then you can estimate how many units can be produced in a given timeframe such as seconds, minutes, hours, or even longer. If it's a labor process, time and motion studies will need to be completed to determine the throughput rate per person and subsequently, the entire process step if multiple workstations are involved. A rule of thumb to include for time and motion studies is a fatigue factor which varies based on the intensity and duration of work being done. The other key factor is to assess throughput based on a speed that 50% of all well-trained people can achieve on a sustained basis. It is advised that an experienced Industrial Engineer be employed or contracted to help establish these rates as professional judgement needs to be applied. You get this wrong and you will be dealing with more employee grievances than you are with prospective customers if you catch my drift. The alternative to establishing maximum run rates is by using empirically demonstrated rates. This process involves determining the rate from every production run and considering the max rate achieved as the benchmark (or standard) against which all subsequent runs are measured. The advantage to using this method is that it doesn't require an Industrial Engineer to determine the Theoretical Max Rates. The other benefit to this method is that "standard" rates are based on demonstrated performance, which removes all debate about rather or not the rate is attainable. This is the method applied by the Factory Operating System (fOS) so that Theoretical Max Rates can be defined organically. As run data is captured in the fOS, the system keeps track of the maximum rate achieved for each product and production line. With this method, the fOS learns the 'definition of perfection' for your manufacturing system using a form of artificial intelligence. As production records are broken, the standard is updated accordingly and best-practices are shared across the network. Continuous Improvement should be baked into the way any manufacturer does business. In any truly competitive landscape, the best performers win - eventually. Therefore, it's imperative to strive to get better everyday in order to increase competitiveness and stay healthy as a business. 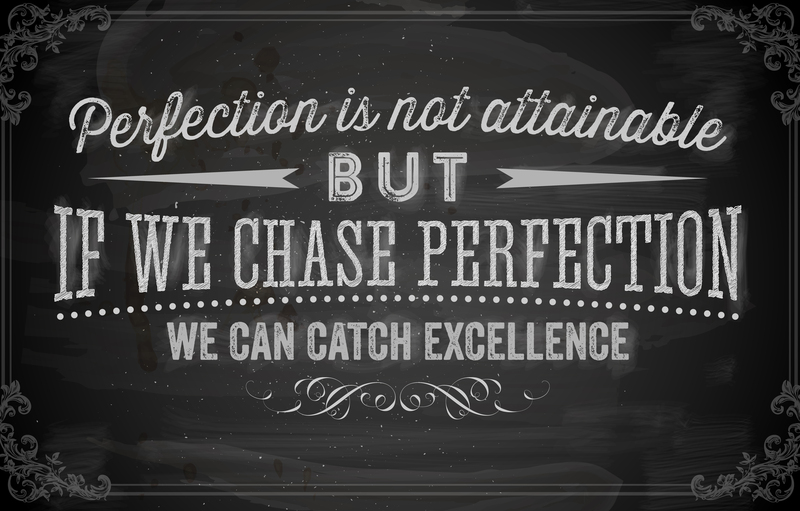 As Toyota has cleverly made into it's slogan, we should all be "in pursuit of perfection". The Percent Perfect Methodology® defines perfection for all manufacturers in the same way; putting all manufacturers on the same playing field regardless of industry, product, location, or other attributes so that everyone has an equal shot at World-Class execution. The fOS helps manufacturers to determine perfection for their specific operating parameters and then measure actual execution against OP on an ongoing basis. The fOS automatically performs the first phase of the Percent Perfect Methodology®. It helps you to define and maintain a current definition of perfection for your manufacturing operation. The optimal approach for implementing the fOS would be to assess where you have WIP buffers in your manufacturing process. Then use the fOS to track efficiencies in between WIP buffers. You'll quickly realize that WIP builds up because process throughputs are imbalanced. The fOS will help you see where efficiency losses are occurring so that stations can be balanced and WIP can be eliminated; creating more of a continuous flow operation over time. A manufacturing efficiency expert such as those at Manuficient can help you to Define Perfection for your operation and initiate your journey to OP.